Please note that the following plans are outdated. You can now only subscribe to the All Unlimited Collaboration plan which will include all features listed below. Learn more about the All Unlimited plan here or on our pricing page. Each subscription plan offers individual features to adjust your account to your special use case. All features of lower plans will be available when subscribing to a higher one including a selection of additional features. Each feature will enhance your working option accordingly. You can find a complete overview of how the features are integrated into the old – Starter, Pro, Business, Business+, Basic, Real Estate, Construction – and the current plan – All Unlimited. Find the features you like to choose the plan you need. Please note that it is only possible to subscribe to the new All Unlimited plan. All basic editorial features are already available with the Basic plan. To a minimum fee, you can subscribe to the Basic plan to get an impression of all basic functionalities of the HoloBuilder editor. You can upgrade your account to any of the paid plans to enhance your available features and add more options for customization. HoloBuilder projects are your personal 360° projects. A project can consist of one or more scenes which are connected to an interactive virtual tour. Note that some features are not yet supported by the Basic plan but can be freed up by upgrading to the corresponding plan. Projects consist of one or more scenes, whereas a scene holds one 360° image as well as a variable number of 2D or 3D objects. With the Basic, Real Estate, Construction as well as the All Unlimited plan, there is currently no limit on the number of projects that can be saved to an account. Furthermore, a project can consist of limitless scenes. Enhance any HoloBuilder projects of 360° listings, locations or construction sites by adding an expandable sheet, e.g. a floor plan. Easily place your projects scenes as hotspots onto the added sheet to allow direct navigation on the sheet. Additionally, you can connect the scenes with each other to create an even more interactive virtual tour. Uploading a single sheet to a project is available for all plans – Basic, Real Estate, and Construction. Expand your options with ‘Multi-level sheets‘ (coming soon) by upgrading to the Real Estate, Construction or All Unlimited plan. Upload custom 2D & 3D objects or create and insert custom 2D & 3D text into one or more scenes of your project. You can also choose from a broad library of predefined 2D & 3D objects , animations , and actions provided within the HoloBuilder editor to enhance your virtual environment. You can choose anything provided in the editor to enrich your projects or upload from your personal library. Go ahead and try! Adding text and objects to a project is available for all plans – Basic, Real Estate, and Construction. HoloBuilder allows for adding 2D images as a texture for certain 3D shapes, e.g. for hiding the tripod or adding own object designs. Simply click on ‘Textured Shapes’ in the tab for adding objects . Select the desired share from the available 3D objects. Now you can add any .png or .jpeg/.jpg 2D image as custom texture. Browse for the corresponding image or drag and drop the image onto the dedicated area of the popup. As a 3D object, custom shapes will have a fixed orientation, whereas 2D images added by simply dragging and dropping them into the scene, will be always moving to face the viewer. Custom shapes are especially useful for creating a kind of nadir patch to cover up the tripod or any other disturbing aspects in a 360° scene. Use, e.g., a round logo saved as .png with transparencies and upload it as the texture for the ‘Square’. Adjust the size, rotation, and location of the object accordingly. Adding custom textured objects to a project is available for all plans – Basic, Real Estate, and Construction. It is possible to add filters and make fine corrections of your 360° images after uploading them to HoloBuilder. Click on the brush icon on the according scene preview in the scene panel to the left to open the post-processing menu. Apply any changes on your image and confirm. Please note that you cannot post-process any scenes of projects created before September 11, 2016. To do so, you would have to re-upload the 360° image of your scenes. Any newly added scenes after this date can be post-processed as usual. Post-processing a 360° image is available for all plans – Basic, Real Estate, and Construction. Group your objects to hide or show them on click, depending on your initial settings. Hide one or more objects in one or more groups when loading a project and only let them show on demand. Switch to the first tab from the left in the right-hand side panel. Create a group and add object to a group by dragging and dropping these objects onto the group folder. Select any object in the scene and attach the action ‘Show/Hide group‘ to use it as a trigger. Showing and hiding groups is available for all plans – Basic, Real Estate, and Construction. 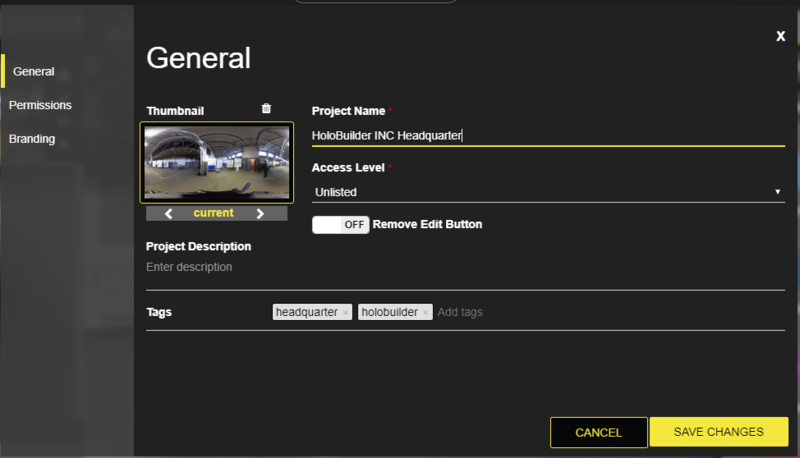 Share your HoloBuilder projects as a standard link or customized fullscreen link . Embed your projects into your personal website easily with the provided HTML iFrame code snippet . Open the sharing options and switch to the ‘Advanced’ sharing for more sharing settings, a fullscreen sharing link and the code snippet for embedding your project on your website. Free sharing, including any embedding options, is available for all plans – Basic, Real Estate, and Construction. Our friendly support team will gladly process any questions, feedback, and feature requests you have as soon as possible. Simply send us an email to support@holobuilder.com. Each premium plan has its own advantages and additions to make it fit any individual use cases. You can find a structured overview of the premium settings included in each of the plans on our pricing page. Each 360° project can contain several attributes that can be chosen from the ‘Project Properties’ overview. Open the project’s property settings by clicking on the name of the opened project at the top of the editor. Some project properties may be available only within selected subscription plans. You can remove the ‘Copy & Edit’ button shown in the player to protect your projects from being cloned by others. Users are allowed to publish a copy or even an edited copy of your project without giving you credit. Turn the toggle switch shown at (1) in the image above on ‘ON’ for removing the ‘Edit-Button’ from the control panel of the player view. To hide the ‘Copy & edit’ button from your projects, you need at least a Basic plan subscription. Depending on your current subscription you can choose the visibility for your HoloBuilder project. The accessibility of a 360° project can be set to public, unlisted or private. Select the access level (2) for your project from the drop-down list in the ‘General‘ properties as shown in the image above. public – Saved HoloBuilder projects will be published on our explore page and are visible for everyone with a share link in social networks, by email or embedded into your website. Your project’s accessibility is set to public by default. unlisted – As ‘unlisted’ saved HoloBuilder projects will not be listed on our explore page but can be shared with a direct link in social networks, by email or embedded into your website. To set your project’s visibility to unlisted, you need at least a Real Estate plan subscription. private – As ‘private’ saved HoloBuilder projects will not be listed anywhere and cannot be viewed by anyone with a standard share link. Only HoloBuilder users given special permissions will be able to view the shared 360° project. To set your project’s visibility to private, you need at least a Construction plan subscription. Invite other HoloBuilder users to a project. Select the ‘Permissions‘ tab (4) (see image above) to open the ‘Project Properties‘ for managing your invites. Manage your project’s members (1) (left image below) by adding or removing other users as viewers. Send invites by email (2) (left image below) to grant other HoloBuilder users access to your project. Please note that you have to send the invite to the email address used for the HoloBuilder account of the person you want to invite to your project. Choose the type of permission (3) (left image below) you want to grant your co-workers/ associates. With any of the previous plans – Construction, Real Estate, Basic, Business+, Business, Pro & Starter – it is only possible to invite other users to ‘view’ a project. When subscribed to the All Unlimited Collaboration plan, you are able to manage further editing rights here. Click on ‘Invite’ to send out your invite. The invite will be sent as an email to the given address. To accept an invite you can simply click on the link provided in the email. If the invited person does not yet have a HoloBuilder account with this email address, he or she can create a new (unpaid inactive) account to access the shared projects overview directly in the editor. Without a paid subscription this person will only be able to view or edit projects that have been shared with him/her. If the invited person does not want to create an account, the project can also be viewed with the share link provided in the email. Permissions for projects are available for all plans. However, only with the All Unlimited Collaboration plan, it is possible to also distribute editing permissions. Learn more about collaboration and the All Unlimited plan here or on our pricing page. Add your own logo to the player view for a better brand recognition and more personal experience for your customers. Select the ‘Branding’ tab (3) (see image above in 2.1) to open the ‘Project Properties‘ for managing your project’s branding. 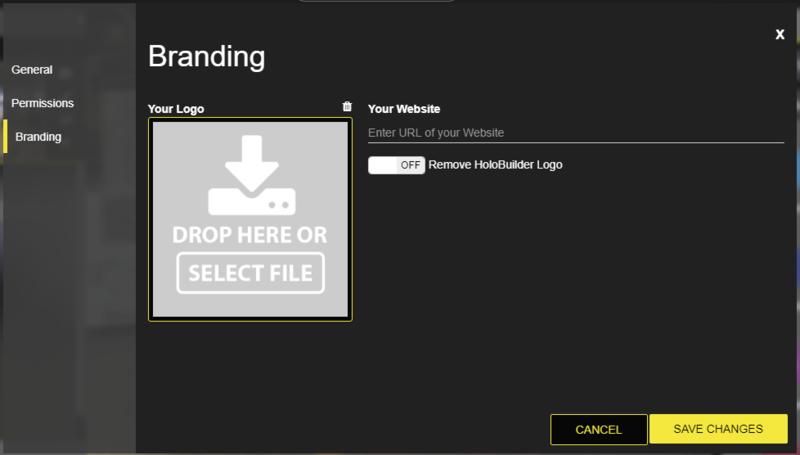 Upload your brand’s logo – Customize the player view by adding your personal logo to your saved projects. Simply drag and drop your logo onto the dedicated area (1) (right image above) or click to select a file by browsing. You can change your uploaded file at any time. The logo will be displayed in the upper right corner above the HoloBuilder logo in the player view. To brand your projects, you need at least a Real Estate plan. Link your homepage – Enhance your branding by adding your homepage link to the attached logo. Simply enter the link in the corresponding field (2) (right image above). To link your homepage and brand your projects, you need at least a Real Estate plan. Remove HoloBuilder logo – Remove the HoloBuilder logo from your saved 360° projects when viewing it in the HoloPlayer. Turn the toggle switch shown at (3) (right image above) on ‘ON’ for removing the HoloBuilder logo from the player view. This way, your logo will be the only one displayed on your shared tour. To remove the HoloBuilder logo from your projects, you need at least a Real Estate plan. To learn even faster about how to work with HoloBuilder, you can book a 30-minute One-on-One video call with a member of our friendly support team. The live tutorial can, e.g., consist of you asking questions about any HoloBuilder related topic. Furthermore, we can prepare a tutoring session for a feature or use case of your choice and show you a few tricks to improve your working process. HoloBuilder offers a variety of special features supporting different use cases. As we are constantly trying to enhance our list of useful tools, there are also some features still in the beta testing phase and others not even released. But, to keep you on track on our next releases, you can already look up each planned feature below. The Multi-level sheets feature allows you to add multiple sheets to a single project. Structure your scenes according to each sheet in the editor and switch between each sheet for more complex navigation possibilities. Learn how to create a project with Multi-level sheets. Easily merge your existing projects with different sheets to a Multi-level sheet project or create a completely new project. Place your project scenes as hotspots onto the corresponding sheets and navigate between the different sheets. Using multiple sheets is only available with the Real Estate, Construction & All Unlimited plan. Hide any faces shown in your 360° images to grant anonymity to any engaging person or bypassers on public locations. Click on the brush icon on the according scene preview in the scene panel on the left in the editor to open the post-processing menu. Toggle the switch for ‘Face blurring’ on ‘ON’ to automatically blur all faces in your selected scene. The face blurring feature is only available with the Construction & All Unlimited plan. Please note that we cannot guarantee that 100% of all faces will be blurred correctly. Document progress in construction sites, changes in properties to manage, or any other processes with different states for single locations. The Time Travel feature allows you to easily document any changes over time in your HoloBuilder projects to show progress or other differences in the displayed environment. Create your 360° tours and add different versions of your project’s scenes over time. You can then easily travel between the scenes according to the depicted time. Time Travel is only available with the Construction plan & All Unlimited subscription. Please do not solely rely on the wall measurement feature as it is just an estimate and might not be accurate. With the Wall Measurement beta feature, you can add nearly realistic measurements of, walls, windows, doors and more in your 360° scene to display customer relevant information on proportions and layouts. To work with Wall Measurement beta, you need to capture each image at an equal height – preferably 63 inches (160cm) measured until the lens of the camera. With this given height, HoloBuilder then enables you to make measurements of parts of your virtual 360° scene. At the moment, it is only possible to measure anything that is in a 90° relation to the floor (e.g. walls, windows, doors, beams etc.). Furthermore, for the calculations, there needs to be a visible intersection of the ‘wall’ and the floor with a 90° angle. To start your measurements in the scene, you first need to select the area or ‘wall’ you want to make the measurements in. Select one point in your 360° image (an intersection point between the floor and a wall) by clicking when the measurement tool is selected. Then set the height and orientation of the whole area. Either click first on a horizontally aligned point intersecting with the floor and then set the height by choosing a vertically aligned intersection point with the ceiling, marking a kind of four-sided figure, or vice versa. Within this marked area, you can now measure anything, such as doors, windows etc, even angular, diagonal distances. Set the height of your camera lens or the measuring unit in the measurement settings. If you have any further questions on how to work with the measurements tool, please do not hesitate to reach out to us. Time Travel is only available with the Construction plan and All Unlimited subscription. As this feature is still in beta testing, we appreciate any feedback. For any questions or problems, please write us at support@holobuilder.com. If you have any further questions regarding the available features and functionalities of HoloBuilder, please do not hesitate to contact us directly at support@holobuilder.com or chat us up live at HoloBuilder.com. This entry was posted in Outdated and tagged 360 degree panorama, editor, features, functions, HoloBuilder, improvement, new features, photospheres, subscription plans, Tutorial, virtual reality, VR. Bookmark the permalink.